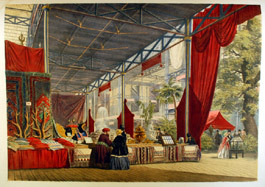 Ornamental saddles, little silver coffee cup-holders and decorative narguilles, or hookahs, beautifully ornamented with silver were included in the display. The accompanying text is both patronising and packed with racial stereotypes. 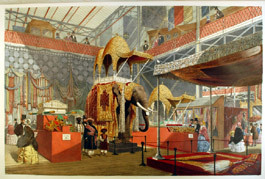 The India display was notable for the elephant from Saffron Walden Museum, which had to be transported to London for the occasion. It was in fact an African elephant, but was the only elephant specimen available in the country.